I decided that writing a book on Wemyss Ware would be a good idea a few years ago. This was under the enthusiastic influence of a few glasses of wine one evening and in the sober light of day the notion was easily dismissed. However, the idea kept nagging at me to the point that I realised I might have to take this ‘project’ a little more seriously. I am a businessman involved with a number of technology start-up companies, so I have absolutely no professional connection to Wemyss Ware, I simply have a liking for it. I have a busy professional life and a number of time consuming interests and hobbies, so the idea of writing a book on a subject, on which I am not an expert, seems almost preposterous. 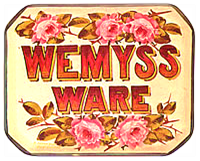 However, a bit of light research sparked by my personal interest made me realise that the so called “experts” seem to know surprisingly little about Wemyss Ware – and worse, there are historical inaccuracies which have been introduced into the Wemyss Ware story by those who do have a professional interest in the subject. These myths are being repeated to the extent they will be adopted as historical fact if not addressed somehow. My light research has shown that the complete history of Wemyss Ware clearly does not exist in any single volume. Many books on the subject are out of print and none of them have documented the story up to contemporary Wemyss Ware. I aim to have the story of Wemyss Ware from 1882 until the present day properly documented while also flushing out some of the inaccuracies that are being repeated in existing accounts. With my other commitments I realised that the ‘project’ to write a definitive Wemyss Ware history would be an immense task. I have therefore broken the project into a number of stages. This Blog represents the kick-off towards the first milestone. In this Blog I will express my opinions, write on Wemyss topics, hopefully present good evidence, allow others to post their opinions, and perhaps create a forum for constructive debate on the topic. Ultimately, having researched the topic through a good number of focused blog posts, I will edit this into the book I had originally imagined. If I get sufficient ‘guest posts’ and constructive comment it might be that I become, not author, but simply editor for the final book. Whether the final outcome is; a glossy coffee table book (unlikely), the definitive accessible publication (the original aim), an eBook download, or even just this blog/web presence, is not overly important. What is important is that there is a proper documentation of Wemyss Ware history. When my interest was sparked in Wemyss Ware I wanted to read all I could find on the subject. I cared not about the format, I was only interested in the content. So this web/blog site will provide the information I was once searching for and could not find. It may, and hopefully will, evolve into the book I once searched for and could not find. This entry was posted in Uncategorized and tagged Scottish Pottery, Wemyss Ceramic, Wemyss Pottery, Wemyss Ware, Wemyss Ware Book. Bookmark the permalink.